Trimmertrap products are all about providing you the safest and most secure storage possible for your valuable equipment. 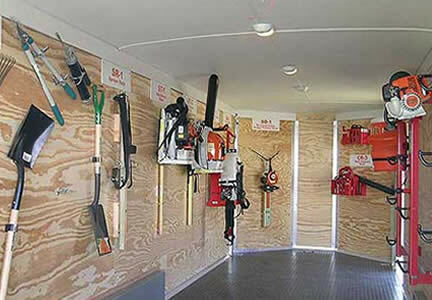 We know that even enclosed trailers can present hazards to trimmers, blowers, mowers, and other tools. Now that many of our racks can be mounted directly on an enclosed trailer, you won't have to worry about you important equipment rolling around unsecured during transportation. Browse our products list to see them mounted in enclosed trailers and learn how you can secure your equipment. ST-5 Blower Rack for the Stihl BR-800X and BR-800C-E - Call for more information!